Winter Park, the closest major ski resort to Denver, has the most extensive, challenging off-piste skiing in Colorado, and a fantastic snow record (370 inches a year). 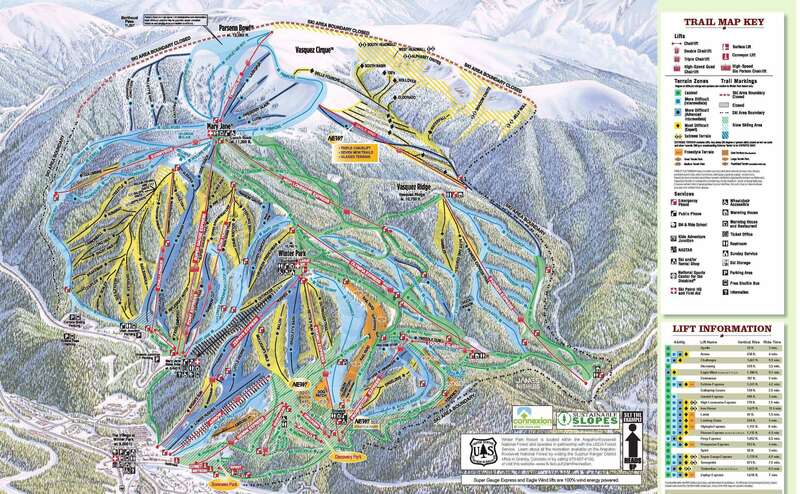 The ski area is made up of three mountains and a fantastic bowl which provide 2886 acres of skiable terrain, which includes 1467 acres of off-piste terrain. Begginers on ski holidays in Winter Park are very well catered for with a dedicated area for learning to ski called 'Discovery Park'. Intermediates will enjoy an abundance of choice during ski holidays in Winter Park. They will find wide open pistes at Vasquez Ridge and Winter Park and have the opportunity for some intermediate bowl skiing at Parsenn Bowl. Advanced skiers will delight in the steeps, moguls and expansive off-piste on offer throughout the area during their ski holidays in Winter Park. The opening of Vasquez Cirque adds an additional 435 acres of challenging terrain for skiers to explore during their ski holidays in Winter Park. Boarders are also well catered for, there are two boardparks with a selection of kickers, rails and spines for freestylers. Freeriders will love ski holidays in Winter Park, there are plenty of long, wide runs of varied difficulty connected by an excellent network of chairlifts. Nightlife is great value and there are a good selection of bars and restaurants to chose from during ski holidays in Winter Park. There is a good variety of terrain at Winter Park, much of it at tree level. There is a large dedicated beginners area (Discovery Park) and a good selection of intermediate runs from the three peaks which make up Winter Park. I didn't like the fact that most of the black runs are fully mogled as that put them beyond my ability level - much prefer to have one side of the run groomed. I found the locals to be genuine and very helpful. The driver of the local shuttle bus went off route on a couple of occasions to deliver us right to our destinations. There is a reasonable choice for food and drink in the ski base or Winter Park village (which offers more options) is only 5 minutes away on the shuttle bus. It's relatively easy to get into Denver via the Amtrak station in Fraser which is only 15 minutes on the shuttle bus from Winter Park.